Since our first attempt was a dud (see below), and with all the rave reviews that we've been getting from our fans (one who just went because of their catchy TV jingle), Mom and I decided to take a chance and drive all the way back to Wareham to visit Red Robin, located in the Wareham Crossing plaza on Cranberry Highway. This time, we got to go inside. It was just around 12:30 p.m. I had noticed that there were quite a lot of cars in the parking lot. I was hoping that it wasn't going to be too frenzied in there. When Mom and I stepped through the large glass doors, we were immediately greeted by a uniformed hostess who informed us that there would be a 10-15 minute wait. However, despite all the cars in the parking lot, the place looked pretty empty. I heard her mutter something about the "St. Patrick's Day rush," but again, there weren't that many customers. Nonetheless, she took my name and gave Mom and I two large, colorful, plastic menus to browse over while we waited. I also asked for a take-out menu, which I promptly received. As we took our seats on the nearby benches, we noticed a TV built into the floor! What a crazy place. Also near the door were a few video games, and a ton of balloons. I'm sure the kiddies love this feature, but should there really be a pile of kids right at the entrance? Maybe these things should be off to the side somewhere, where people aren't waiting to be seated. When the hostess finally called my name (although Mom earlier bolted off the bench when she heard the name "Marybeth" - I guess to hungry ears it could have sounded like "Laura"), we got up and followed her into the dining room. She asked us if we preferred a table or booth, and since Mom likes tables and I like booths, we chose a table. The hostess led us over to a banquette, so I was kind of excited since we could each have what we wanted. The hostess told us that Caitlin would be our waitress, and she would be over to greet us in a moment. That moment wasn't very long because before we knew it, Caitlin appeared ready to take our drink order. She had asked us if we had ever been to a Red Robin, and before Mom could answer, I screamed, "Yes!" The reason I did that is because - although this was our first visit - I didn't feel like listening to the history of the place, tips on how to order, and all the other tidbits that come in the learned script that the poor waitstaff has to memorize. I just wanted to eat. While we were waiting on the bench by the entrance door, Mom and I had decided to order milkshakes with our meal($3.99), which came with its own refill tin. I was going to get banana, and Mom was going to get chocolate, but Caitlin sadly informed us that the milkshake machine was broken. Distracted by the word "no," Mom and I decided on two Diet Cokes. When Caitlin went to retrieve them, we went back to choosing which gourmet burger we were going to have. 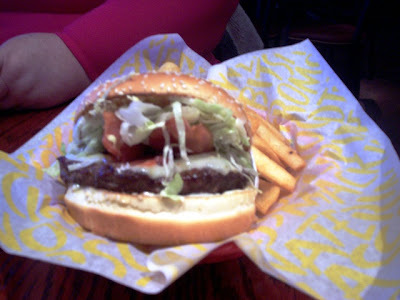 After all, gourmet burgers are what Red Robin is all about. Caitlin quickly returned with the two Diet Cokes which had been poured into glass Red Robin tumblers. Meanwhile, Mom and I had finally settled on our burger choices. Mom chose the Red Robin Bacon Cheeseburger ($8.99) with no tomato and pepper-jack cheese (she had a choice of a few cheeses). I chose a burger that happened to be a Red Robin Signature Selection - the Whiskey River BBQ burger ($8.99). When Caitlin asked us if we wanted them "pink" or "no pink," we weren't surprised. On a cardboard box at each table, there is a small section that explains that "pink" means medium, and "no pink" means medium well. Caitlin took away our menus and left Mom and I to check out the interior. Red Robin is definitely a family friendly restaurant. With the loud music, colorful decor, and a large statue of a "Red Robin" giving a thumbs up to customers, I can't see why kids wouldn't like this place. It almost reminded me of Chuck E. Cheese's, only more adult (no ball jump, unfortunately). Not only were there TVs in the floor, but there were TVs on the wall that featured various sports games. 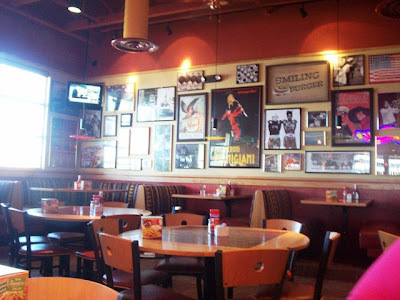 I was seated across from a huge wall covered in framed posters of iconic people, TV shows, movies, and food. The exposed pipes across the ceiling made for a very trendy look, while the bright red and beige colors made the dining room feel very welcoming. Modern chandeliers and ceiling fans were situated above each table and booth, and I noticed that each table could be expanded by folding up the leaves. Mom had a good view of the kitchen, which housed a plethora of stainless steel cookware. On each table was a container of Red Robin seasoning, which encouraged all to sprinkle it liberally over the burgers, salads, and other dishes. Also on the table was a cardboard box that gave some hints about certain things offered (the bottomless steak fries, the refillable drinks, etc.). Both Mom and I also commented on how clean everything was, and we were surprised considering Red Robin is very "kid-friendly." 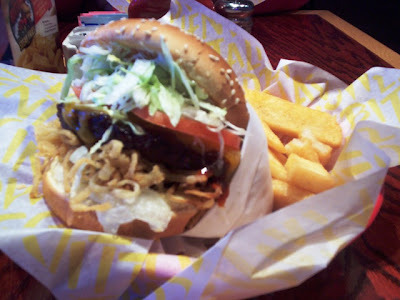 If burgers are your thing, then Red Robin is the place for you. Specializing in "gourmet" toppings rather than plain old ketchup and mustard, even picky eaters won't be able to decide which burger to order. My friend, Gregg, recommended the Royal Red Robin Burger ($9.29), which is topped with a fresh, fried egg. Other burgers include the Sauteed 'Shroom Burger ($8.99), the Pot Roast Burger ($9.49), the Banzai Burger ($8.99) topped with grilled pineapple, and the 5 Alarm Burger ($8.99) if you're feeling hot and spicy. They even have the Monster Burger ($9.99) which includes two huge beef patties. The "Knife & Forkers" list includes the Burger Parmigiana ($9.99), the Honky Tonk BBQ Pork Burger ($9.99), and the Chili Chili Cheeseburger ($9.49). All "Knife & Forkers" are served with garlic Parmesan steak fries. If you're looking for something to wet your appetite, you can choose from one of their many starters. The Towering Onion Rings ($7.99) look great because they arrived stacked into - what else - a tower. They also have Red Robin Buzzard Wings ($8.99), the Just-In-Quesadilla ($9.99), and the Cheeseburger Con Queso ($6.99), which is a spicy cheese dip with fresh ground beef, topped with salsa and fresh cilantro and served with corn tortilla chips and Red Robin's own jalapeno-cheese flour tortilla chips. For sandwiches, soups, and wraps, Red Robin offers the Whiskey River BBQ Chicken Wrap ($9.79), the French Onion Soup ($4.99 crock; $2.99 cup), and the Souper Sandwich Combo ($9.99). Salads include the Apple Harvest Chicken Salad ($10.49) and the Crispy Chicken Tender Salad ($9.99). Entrees include the Gourmet Mac & Cheese with Chicken ($11.49; vegetarian $9.49). Mom was drooling over this one, but she decided to save it for another time. Others like the Arctic Cod Fish & Chips ($10.99) and the Chicken Parmigiano Pasta ($11.79) sound very delicious as well. Red Robin also features a great dessert menu, kids menu, and a list of "Chillin' Concoctions," a.k.a., cold drinks. We hadn't been waiting long before we spotted a waitress (not Caitlin) coming over with our burgers. After figuring out who ordered what, she left Mom and I to dig into our delicious-looking burgers, which arrived in little red baskets. Mom's bacon cheeseburger was described on the menu as the best bacon cheeseburger in the city, state, nation, and all the world. It was a very nice size - not so small that you had to look for it, but not so large that you felt like a pig if you were to eat the whole thing. The meat was cooked perfectly (no pink). She was impressed by the look of it, and enjoyed that it came in a paper holder (Mom called it a diaper - yuck). Whatever it was, it kept the burger together nicely. The bacon was very meaty and tasty, the pepper-jack cheese was nicely melted, the lettuce was shredded and crisp, and it had the perfect amount of mayonnaise. The bun was fresh and covered the whole burger evenly. It made for a really tasty meal. She would definitely order this burger again. Mom even enjoyed her fries, and she said that there was just enough of them to go with the burger. Red Robin was never to give us a second batch of their bottomless fries, since neither Mom nor I are big fry fans. I did, however, enjoy my seasoned bunch very much. My burger also came wrapped in a "diaper" and I was glad because of the layer of BBQ sauce that topped the sandwich. Actually, I was quite impressed at how neat the burger was. You would think that since it 1) was large enough that you had to open your mouth really wide to get it all in, and 2) was covered with slippery lettuce, tomato, mayonnaise, and BBQ sauce, that you would be covered in burger toppings. Not at all. I quite enjoyed the not-overpowering onion straws that supported the bottom half of the patty. All the flavors blended really well together, and the meat, like Mom's, was cooked perfectly. Mom left $32 in the bill holder for Caitlin, which included a 20% tip. She was a very good waitress. While we were sitting there vegging out our from our meal, a friendly older woman in a light green Red Robin shirt (the regular waitresses were wearing red) came over to our table to ask how everything was. We said it was great, and we also said the same when she asked how our service had been. I asked Mom if she was coming over to all the tables to ask how their experience was, but she had seemed to only stop at ours. She had walked by the other tables smiling, but never stopping. Odd. Maybe she saw me writing down information and/or taking pictures. Perhaps she thought we were celebrities. Either way, we were honest about our visit. We thought it was great. Before we left, Mom and I used the restroom. Like the dining room, it was very clean and organized. As we headed back to my car, we were both glad that we had finally been able to give Red Robin a real review. Although the frantic chain atmosphere is not something we usually go for, Mom and I visited today at the perfect time. We got to sample their great burgers, had good service, and thoroughly enjoyed ourselves. We'll definitely be back, but on an off day. No Saturday nights for us! 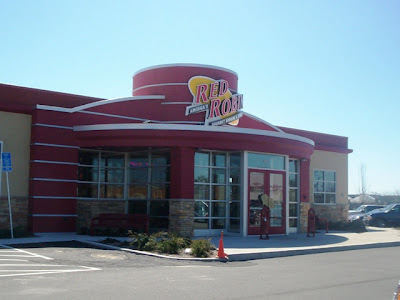 The Red Robin in Wareham is located at 2421 Cranberry Highway in the Target/Lowe's plaza (Wareham Crossing). The hours are 11 a.m. to 10 p.m. Sunday through Thursday, and 11 a.m. to 11 p.m. Friday and Saturday. For more information, call (508) 273-0441. 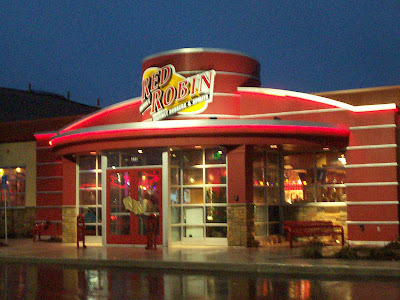 A few weeks ago, my sister and her boyfriend visited a Red Robin restaurant - the first one in the area (well, within a 25 mile radius). Mallory raved about her burger to me and Mom, so naturally we decided to take the drive to Wareham, MA, to see how good the burgers were for ourselves. Supposedly, you can get just about any type of gourmet burger. Sounded delicious! Well, we never made it to Red Robin. Did we follow the MapQuest directions? Yes. Did they correspond with the directions my sister gave us? Yes. Could we find the place without driving up and down Cranberry Highway for about 30 minutes? No. Why, you ask? THERE WAS NO SIGN!!! Apparently, Red Robin is brand new to the area. So new - and deeply set within a large plaza - that there were no indications from the street that this restaurant even existed. I was BOILING. If there is one thing I hate, it is 1) wasted time, 2) wasted gas, and 3) not being able to go to the place we specifically drove all the way up there for. OK, so three things. Whatever. We finally pulled into the parking lot at around 6 p.m. Guess what? So did everyone else. There were no parking spaces, there were kids all over the place, and Mom spotted about 100 backs to the wall waiting for tables to be emptied. FORGET IT. I couldn't take it. I wasn't about to wait another hour to get a damn hamburger. After all that driving around and losing it in the car, we left Wareham and headed for Bravo's Restaurant, where we had a lovely meal. Oh, and to top it all off, it was pouring all day ... and my check engine light was on. We'll definitely try Red Robin again (now that we know where the damn place is), but certainly not at 6 p.m. on a Saturday night. A lot of fans often comment on the time that Mom and I go out to lunch/dinner. We often visit a restaurant at around 3 p.m., and the reason for that is that I HATE CROWDS. Not regular, calm, restaurant crowds, but loud, frenzied crowds that seem to gather inside of chain restaurants on weekends. No thank you. I'd rather go through a drive-thru, believe it or not. Mom agrees. She said that she doesn't like the craziness and there is a good chance that you're not going to get the best service.